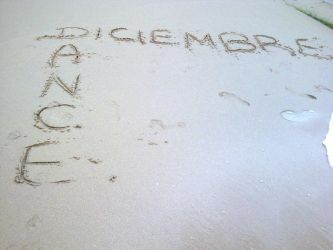 Diciembre Dance Group was born in August 2008 as an attempt to join choreographers and dancers to make work related with social issues. Alba, the first project of the company, was marked with a "merit" in the MA Choreography at Middlesex University. Main Square was performed as part of Resolution! and had very good feedback from the audience members. As a freelance dance artist, a significant area of her work is community-based. Aside from these commissions, she creates pieces possibly of an eclectic nature. Merlyn and Claudia met at Exeter University where they studied physical Theatre and Psychophysical Performer training. Since graduating 3 years ago Claudia went on to train at Laban. Merlyn concentrated on music and music production. 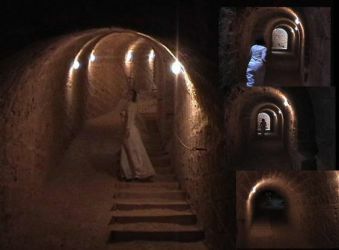 They have continued to collaborate, performing in London, Bristol and various site specific locations. Influenced by Pina Bausch, Théatre de Complicité, Robert Wilson and Angelo Badalamenti, they constantly strive to push the boundaries of live performance staying true to their continued investigation of human emotions and psyche. Hana Saotome trained at the Northen School of Contemporary Dance. She has been a member of Beyond Repair Dance Company since 2006 touring extensively throughout the UK. More recently she has been dancing and performing for Francis Angol. Aya Jane Saotome trained at London Contemporary Dance School, notable performances include Movement Angol and Irven Lewis Dance Theatre. She has recently returned from New York where she was studying a range of African dance styles and participated in Urban Bush Women’s Summer Institute. This piece is the first time that Hana and Aya have collaborated creatively together! The Continent Stories Dance Theatre is a company started by Silja Grey, it invites other artists to collaborate with movement and to investigate the possibilities to expand the concept of dance. You could say the company allows the concept of dance to be re-discovered. Dance is not just about movement itself, it goes beyond the movement. There are no limits in ‘what is dance.’ Dance can contain elements of interdisciplinary practices, it can be a collaboration between sound, visual arts and movement. Silja's aim for the company is to be able to look beyond any borders, to stretch my mind across all the disciplines and to find something new. Debbie Shine is a contemporary choreographer working primarily in Release/Limon technique, with an interest in martial arts and ritual dance. She has been working in London since 2004, and has shown her work in various venues including the Place (as part of Resolution! ), Riverside Studios (as part of a triple bill which she organised, and in which she worked collaboratively with Cann Dance company), and the Courtyard Theatre (as part of Cloud Dance Festival). A creator from a young age, Jennifer Essex has been presenting work professionally for the last five years. As well as presenting work under the collective Young Lungs Dance Exchange, of which she was a founding member, she has developed works for theatre and film. The Junior Professional program of Contemporary Dancers, Theatre Serendipity, and Sarasvati productions have all commissioned work from her. In 2005, Winnipeg’s Contemporary Dancers performed her solo “Royal Outlaw”. Her work combines intricate visual imagery with demanding physicality, imaginative words and an innate sense of theatricality. ktdt, Katie Thies Dance Theatre is a London-based contemporary dance theatre company. Ktdt was established in 2006 out of the independent workings of choreographer Katie Thies and has expanded to become a collaborative-based company focusing on using cross-disciplinary arts in dance and bringing the art of story-telling to life in performance. Transient Dance Theatre is proud of being formed of a multicultural cast from various backgrounds. The TDT was founded in 2008 by Spanish choreographer and director Ana Fernández Martínez. The initiative of this group arises from the need for an environment where they are able to express, explore and exchange creative ideas and challenges and collaborate with various artists. The company aims to create and perform alive and inquisitive work with alternating artists in constant exchange of new ideas. Jessica Green is a London based dancer and choreographer with a First Class BA Hons in Dance, currently working on independent projects that celebrate honesty and a dialogue between performers and their audience. Works include Kaleid/Collide – Resolution! 2009 at The Place: Robin Howard Dance Theatre, Dust – Collision Festival 2008, Area 10 Peckham, Dust-Spin – The Space, Isle of Dogs, The Moon is my Master – Happenings at The Space 2007. Jessica Green also works in youth dance and in arts administration. I am a dance lecturer, choreographer and performer, currently working across the London boroughs. I graduated from Kate Simmons School of Dance and the Laban Centre with a Professional Diploma in Dance Studies and a Master Degree in Choreography. Originally from Norway I produce work for my own dance company KORSNESkompani and in collaboration projects with other artists, such as artist Sarah Turner and sound engineer Rob Colquhoun. As a choreographer I often find inspiration from my homeland, visual imagery and natural phenomenon’s, which makes my work highly emotional and gives my work a primal feel. Eade & Perkins Present… has recently been formed by Bryony Perkins and Rohanna Eade. With an interest in the crossover between dance and other art forms, we are developing a practice which uses improvisation to challenge and explore what we know (being dance) and what we are less familiar with (being text). Improvisation can be what we perform, or it can be a tool for devising material which is eventually set. Underlying the work is a desire to communicate directly with the audience; to see them as equal, to entertain them and to do this through a variety of mediums. Armadillo Dance Project is an ongoing collaboration between choreographer Kathleya Afanador and composer Allen Fogelsanger. They use interactive technology as a creative and collaborative tool for making performances in which movement interacts with other media via computer analysis of dancer-produced data. The aim in using this tool is not to spotlight the technology but rather to create interesting and unusual relationships between sound and movement. These relationships exist within expanded fields--the sounds are often not music and the movements often not dance as traditionally conceived. The resulting audio-visual performance may offer experiences ranging from the cerebral to the sensual, combining into a challenging puzzle of formal structures and playful juxtapositions. RTDC is a dance-theatre company founded in 2001 by independent contemporary choreographer Ebru Aydar in Madison-WI /USA. Company members were local dancers, actors, visual artists, multimedia artists and musicians who combined individual artistic vision in order to send a message to an audience. 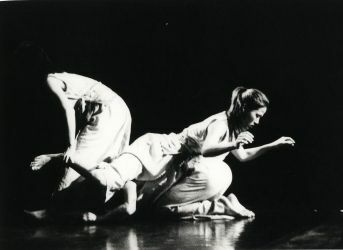 RTDC was the first company in Madison-WI/ USA to use improvisation as a performance tool. 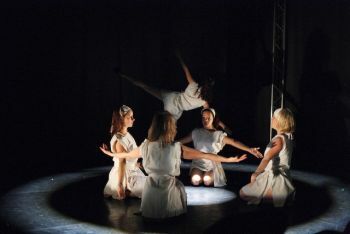 RTDC’s work can be classified as dance theatre, performance art and post-modern dance. Nux was founded in Barcelona by Maïté Delafin in 2006. The company’s first residency at La Caldera (Dance Centre of Barcelona) resulted in its first work, L’épaisseur des choses ('The density of things'). 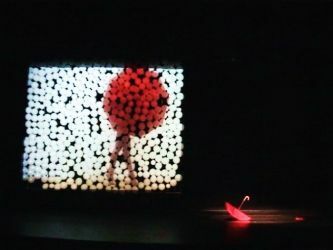 L’épaisseur des choses won a prize in a 2007 choreographic competition in Sabadell (Barcelona) and was a finalist in a similar competition in Madrid. A second residency in Choregraphic Centre of Galicia resulted in Déixame bostezar ('Let me yawn').